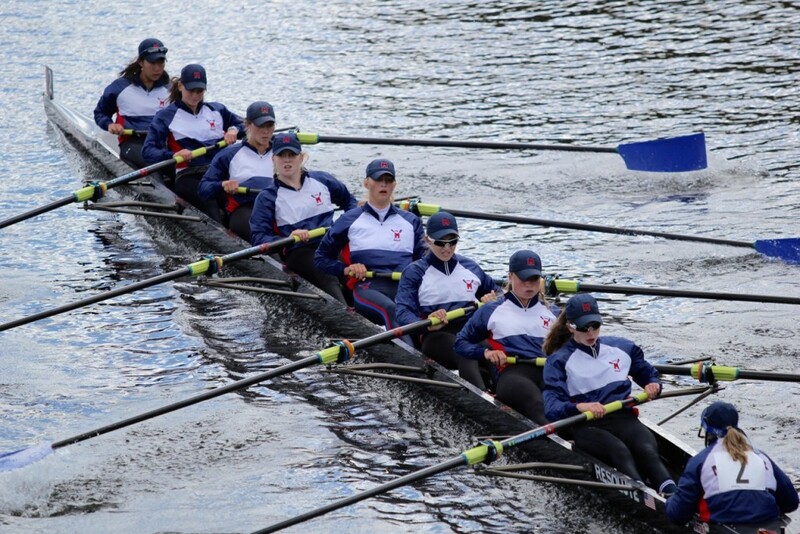 West Windsor, NJ – Princeton National Rowing Association’s Mercer Rowing Club (PNRA/Mercer) women’s youth 8 plus coxswain crew won a coveted medal at the Head of the Charles Regatta (HOCR) on Sunday by finishing third out of 85 high school-aged crews in the event. Known as the biggest regatta on earth, the HOCR attracts 11,000 masters, collegiate, and junior rowers from around the world to compete in a three-mile race. HOCR is a head race, so boats start sequentially approximately 15 seconds apart and compete against one another and the clock. Crews start the race in the sequence that they finished in the previous year’s regatta. “We were able to start second this year and that gave us a great advantage. We didn’t have any other boats around us,” said senior co-captain Caitlin Cleary (Princeton High School).” The HOCR race course is notoriously difficult, full of curves, turns, and six bridges that boats have to pass under one at a time. Slower boats are required to yield to faster boats, but crashes sometimes occur as boats try to pass each other. The course was made more challenging this year by wind gusts up to 12 miles per hour. “We are used to rowing in windy conditions because we train on Mercer Lake so we didn’t get psyched out by the wind,” said Cleary. The PNRA/Mercer girls finished the race in 17 minutes, 22 seconds and gave much of the credit for their good performance to their senior coxswain Colleen Gillis (Freehold Township High School) who skillfully navigated the course, taking tight turns to avoid adding extra distance for her boat to travel. “Our exciting result at Head of the Charles will inspire us to train hard this winter to continue to be competitive with the top crews in the country in the spring,” added Cleary. PNRA/Mercer is likely to match up against HOCR winner Saugatauk Rowing Club and second place finisher Marin Rowing Association at the USRowing Youth National Championship Regatta on Mercer Lake in June, 2016. In addition to Cleary and Gillis, the crew included senior co-captain Kate Hickey (Notre Dame High School) in stroke seat, sophomore Sara Hansen (West Windsor Plainsboro High School South), junior Katie Lustig (Council Rock North), sophomore Mia Barkenbush (West Windsor Plainsboro High School South), senior Rachel Mumau (Millstone Township), senior Elise Gorberg (West Windsor Plainsboro High School North), and senior Eileen Hu (West Windsor Plainsboro High School South). The girls are coached by Steve Baranoski in his first season with PNRA/Mercer. The PNRA/Mercer men’s youth eight plus coxswain crew also was impressive, finishing seventh out of 85 crews with a time of 15 minutes, 41 seconds. Senior co-captain Kevin Borup (South Brunswick High School) was full of praise for his teammates and especially senior coxswain, Nikhil Modi (West Windsor High School Plainsboro South). “Nikhil coxed a great race and his experience on this course really showed,” said Borup. Modi’s coxing skill was particularly evident around the Elliott Bridge. Another boat was gaining on PNRA/Mercer but fell back when the Mercer County crew came through the bridge in perfect position to take the next turn on the inside. “We row together really well, whether Nikhil has us at a 33 stroke rate or a 39 stroke rate, like we were in our final sprint,” added senior co-captain John Tanguay (Hopewell Valley High School), referring to the boys’ strokes per minute. In addition to Borup, Modi and Tanguay, the PNRA/Mercer crew featured junior Daniel Stoddard (West Windsor Plainsboro High School South), junior Andrew Hickey (Notre Dame High School), senior Jason Fleurial (Princeton High School), junior Carter Levine (Princeton High School), junior Tyler Harris (West Windsor Plainsboro High School North), and freshman Jack Gallagher (Council Rock High School North). The boys are led by head coach Justin Ochal in his second year with PNRA/Mercer. 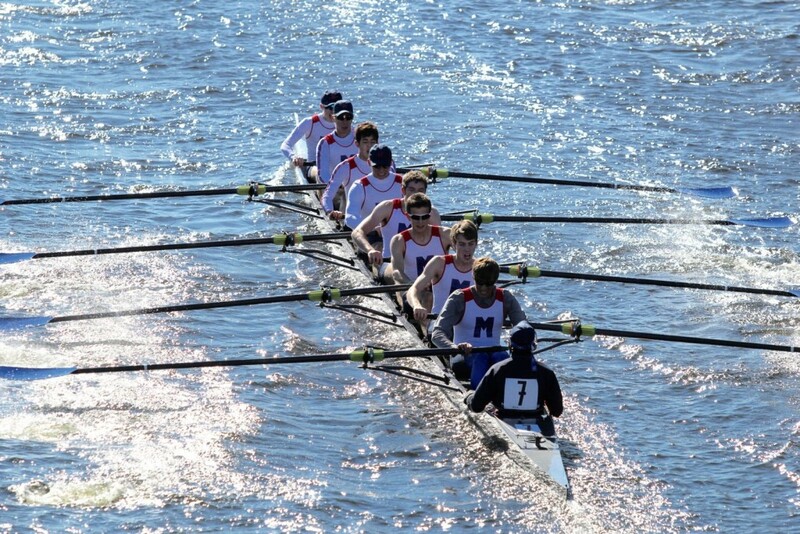 Also competing at the Head of the Charles were crews from the Mercer Masters, Peddie and Lawrenceville schools.